This picture, somewhat mysterious in its origin, was discovered at the time of the 1918 armistice in the cellar of the boarding school where Berthe Petit, a humble Franciscan Tertiary, had been educated. After the troops had departed one of the Bernardine nuns in putting things in order found a piece of cardboard on which was pasted a pornographic picture and she tore it off to consign it to flames. To her astonishment she found that it covered this beautiful representation of the Blessed Virgin! It seems to combine the art of both the Eastern and the Western Rites. The facial features resemble those of the well known Pieta. Prayer before this picture has brought signal favors. O most loving Mother of my Lord Jesus Christ, thou who dost never reject nor despise anyone who turns to thee with a contrite heart nor refuse to console the afflicted, behold, poor and sinful, I draw near to thy holy image with deep devotion, and beseech thee to obtain for me the grace to honor and love thee with all my strength. 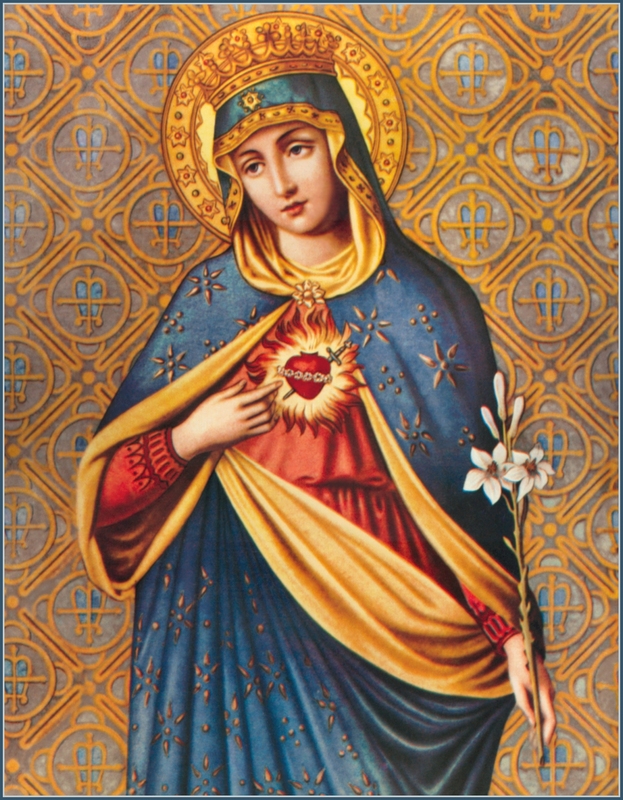 O merciful Heart of Mary, let me obtain mercy from thee as so many sinners already have obtained it; for what is thy Heart, O Mary, but a Heart of mercy? How is it possible, then, that grace could be refused to anyone who implores it from this seat of mercy? Most tender and compassionate Mother, thou knowest how much an afflicted heart is in want of compassion, because the intensity of thy sufferings was so great that all mankind together would have been incapable of supporting it. Oh, what unutterable bitterness filled thy soul when thou didst contemplate the disfigured form of thy beloved Son, when thou didst receive His mangled and lifeless Body into thy virginal arms, and pressing It tenderly to thy maternal heart, didst embrace It countless times, didst bedew It with a stream of burning tears, and finally didst rest thy agonizing heart on the wounded brow of thy Jesus! I recall to thy mind this thy inexpressible anguish, and beseech thee to obtain for me the pardon of my sins. O Mary, intercede for me with Jesus, whom thou didst bear in thy arms! O Jesus! O Mary! by your unutterable suffering, have pity on me, a miserable sinner. O dearest Jesus, show to Thy Heavenly Father all the wounds and anguish which Thou didst bear for me! O sweetest Virgin, show Him all the tears which thou didst shed for me! O Son! O Mother! show Him all the agony, all the anguish of heart which you endured for me. O Mary , I beseech thee, through this most painful mystery of thy dolors, obtain mercy for me from God the Father, and taking the mangled and dead Body of thy beloved Son into thy maternal arms, offer Him to the Eternal Father in the same manner as thou didst once offer Him His pierced Side and thy own broken Heart, His bitter sufferings and thy painful compassion, His and thy burning tears, His and thy sighs, in a word, everything which Jesus and thou suffered upon earth, that, through these same sufferings, thou mayest obtain mercy and pardon for me. Amen.